Though some might claim Ali’s greatest achievement in life was his prowess in the boxing ring, others would argue his amazing battle against Parkinson’s was his true shining moment. Harrisburg, PA, Parkinson’s care experts share some of the many ways Ali fought the disease and inspired others to do the same. Parkinson’s affects millions of people, with thousands of new cases diagnosed each year. To raise awareness and attempt to put a stop to the disease, Ali began speaking out, using his name and wealth to fund research for more treatment options and a possible cure. Ali’s presence in the Parkinson’s community spoke volumes, even when he was no longer able to speak any words. Taking care of an elderly loved one with Parkinson’s disease can be challenging, which is why Ali wanted to bring awareness to Parkinson’s caregivers as well. Ali’s wife Lonnie cared for him during his decades-long battle with Parkinson’s. Over the years, the two immersed themselves in a life of philanthropy that included advocating for Parkinson’s caregivers around the world. To reach lawmakers and raise money for Parkinson’s research, Ali worked with Michael J. Fox, another celebrity living with Parkinson’s. Ali and Fox appeared before Congress in 2002 in hopes of receiving more federal funding to help fight against Parkinson’s. Ali always stressed this disease does not recognize titles, personal achievements, character, or any amount of talent. However, he thought using his fame and receiving help from other well-known celebrities could help raise awareness and get the necessary funding. Although Ali knew there was no cure for the disease, he remained hopeful one might be found to help others in the future. Ali established and funded the Muhammad Ali Parkinson Center in Arizona, which helps people get the treatment they need to manage the disease. The center also donated money for research to find a cure. 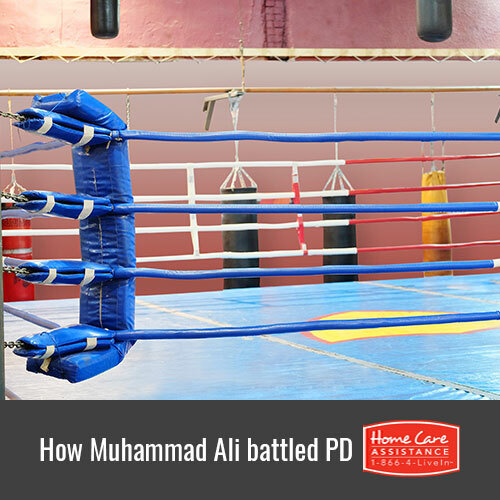 Many people view Ali as a cultural icon and boxing champion, but the people at his Parkinson Center in Arizona consider him a hero. If you have an elderly loved one who is living with Parkinson’s and needs help managing its symptoms, turn to Home Care Assistance. We are a leading provider of home care in Harrisburg, PA, and our part-time and live-in caregivers are expertly trained in Parkinson’s care. For more information on our elderly care services, call one of our knowledgeable Care Managers at (717) 540-4663 to schedule a free in-home consultation.